He has written numerous best-selling books on oil and geopolitics: The Lost Hegemon: Whom The Gods Would Destroy, Full Spectrum Dominance: Totalitarian Democracy in the New World Order, Seeds of Destruction: The Hidden Agenda of Genetic Manipulation, and not to forget: Target China to name only a few. His books are translated into 14 foreign languages. The following interview focuses on Engdahl’s latest book in German Secret files NGOs (Geheimakte NGOs). Ludwig Watzal: I guess we could agree upon the fact that the CIA is the world’s worst terror organization. After WW II, hardly any coup d’état or organized uprising happened without the helping hand of the CIA. As I understood your book, in the last 25 years, the CIA got quite a few so-called little helpers in the form of NGOs. Please, could you elaborate on that? 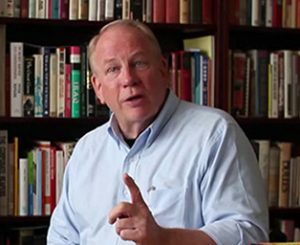 William Engdahl: During the Reagan Presidency very damaging scandals were becoming public about CIA dirty operations around the world. Chile, Iran, Guatemala, the top secret MK-Ultra project, the student movement during the Vietnam War to name just a few. To take the spotlight away from them, CIA Director Bill Casey proposed to Reagan creating a “private” NGO, a kind of cut-out that would pose as private, but in reality, as one of its founders the late Allen Weinstein said in a later interview to the Washington Post, “doing what the CIA did, but privately.” This was the creation of the NGO named National Endowment for Democracy in 1983. Soon other Washington-steered NGOs were added like the Freedom House or the Soros Open Society Foundations, the United States Institute of Peace and so forth. LW: You quote Allen Weinstein, co-author of the founding act of the NGO National Endowment for Democracy (NED), saying; “Much of what we do today was done 25 years ago by the CIA.” Are the US NGOs such as NED, CIPE, USAID, NDI, not to speak of the Soros network, the fifth column of the CIA? LW: Your critic focused mainly on a few US NGOs or would you include all non-governmental organizations in general? Aren’t all these NGOs driven by a good mind and noble deeds to spread democracy and freedom around the world? Of course, not all NGOs are doing the work of the CIA. I focus on the ones with a hidden political agenda, who, as I describe in the book, have weaponized human rights and the word democracy for devious ends. LW: In 1984, the hedge fund-Billionaire George Soros, established in Budapest the Soros Foundation. His first target was Poland. Pope John Paul II and US President Ronald Reagan met in 1982 at the Vatican to discuss the destabilization of the Communist Bloc. In this endeavor, has there also been an involvement of the Soros Foundation? LW: The two chapters on the plundering of the former Soviet Union by the CIA, Soros and his Harvard Boys in cooperation with the Yeltsin clan and former KGB official is quite shocking. Please, elaborate on this Mafia-like undertaking. The interesting point to note is that President G.H.W. Bush, former director of the CIA, ordered three simultaneous NGO destabilizations in the same year, 1989. The three were Russia, China in Tiananmen Square and Yugoslavia. The book documents this in great detail. LW: After Vladimir Putin succeeded Boris Yeltsin as Russia’s President, he immediately stopped the robbing of Russia. Do you think that could be one cause why the political class in Washington hates and demonizes him to such an extent, which is irrational? LW: The dismantling of Yugoslavia was a catastrophe. The Germans under the chancellorship of Gerhard Schroeder and his infamous foreign minister Joschka Fischer joined forces with Clinton to overthrow the Serbian President Slobodan Milosevic. In this coup-like operation, were there also NGOs involved? And what was their strategy? LW: When the Arab masses went into the streets of Tunis, Cairo and Tripoli, the Western media, and political class were thrilled. Finally, democracy, freedom, and human rights found their way into the Arab world. Were these uprisings spontaneous or were they organized and orchestrated from outside forces? LW: In the old days, the conquerors brought in its wake the missionaries. Today, the Western neo-colonial powers come with hundreds of NGOs who teach the indigenous population how Western democracy is supposed to function. Do you think the NGOs serve the interest of these people? What about the German NGOs who especially carry a lot of ideological ballast, for example, in the form of gender mainstreaming with them? What do you make of that? LW: At the beginning and at the end of your book you refer to George Orwell’s double think that means “War is Peace, Freedom is Slavery, Ignorance is Strength.” Do we live in times where the original meanings of words become different contents? Do the US Empire and its vassal states wage war in the name of democracy and destroy the nation states with the same democratic rhetoric? LW: If you could give the NGOs a piece of advice, what would you tell them? LW: Mr. Engdahl, thanks for the interview. WE: Thank you for your interest and excellent questions. This article was posted on Monday, July 17th, 2017 at 2:26pm and is filed under (Ex-)Yugoslavia, Afghanistan, CIA, Disinformation, Egypt, Interview, Libya, Media, NATO, NGOs, Poland, Propaganda, Russia, Sudan, Syria, Ukraine, United Kingdom, United States, US Hypocrisy.